The February meeting featured a presentation on early flight history and the story of the Savidge family that were pioneers in airplane flight and did air shows in Alvin, Texas before the First World War. Some of the family settled here and some descendants attended our meeting. LOOKING FOR THAT ’SPECIAL’ PRESENTATION? Look no further than your local Museum! Richard Klapper, Tom Stansel & others are available for subjects such as: * The Alvin Train Depot * Marguerite Rogers House Museum * The Savidge Brothers-Aviation Pioneers * Dr. Foster Reid Winn * Alvin Schools * AMS ‘Infomercial’ The Downtown Buildings of Old Alvin for more information call 281/331-4469. 15th Annual Alvin Area Garden Tour-April 18, 2015 This year's theme-- "Conserving, Recycling, and Winterizing"--promises some tips and pointers for every Gulf Coast gardener/ homeowner. Along with the cottage and grounds of the House Museum, we've booked three private gardens for touring: Joe Sumners' on Old Galveston Road, the Stuksas' on Troon Drive, and the Webbs' on Highland Drive. Once again, Alvin Garden Club's Annual Flower Show will be part of our line-up, and we'll have the usual Plant Sale out of the House Museum garage. There are two ways for every AMS member to help. The Graefs will bring in some blooming plants from Smith Nurseries for our sale, but we'll also need donated plants of all kinds. Please think of our event during your spring cleanup. And please get ready to say "yes" when an AMS member calls to sign you up for a two-hour workshift at one of the sites. We'll need plant cashiers and sale watchers, ticket takers and garden watchers. No "job" is difficult, but all are necessary to the success of our event. Sign-up sheets will be out at the February AMS meeting, and calls will begin after that to complete our workforce. If there is a particular job you'd like to sign up for early, please call Pat Klopp at 281-393-1538. Before most calling begins, she will be looking for various kinds of help: counting out and batching tickets and flyers in February for distribution to our advance ticket sellers and for inclusion in our cash boxes; doing some "superficial" cleaning of the cottage and outbuild-ings and/or receiving donated plants on the Friday before the event; chairing tour sites (picking up supplies and set-ting up ticket table and/or taking it down and returning supplies to the House Museum) on the day of the event. Remember that your loyal AMS participation is what keeps our event successful! Volunteers are Special People Jean Vance has been a Society member since 1992. Her volunteer activities in-clude five years as a docent at the Mar-guerite Rogers House Museum and serv-ing as Treasurer for 6 years. She has also worked in the Gift Shop and helped in setting up Temporary Exhibits. Current-ly she is working on culling and organiz-ing old Society files. Jean says that vol-unteering in the Society “was a great benefit to her after retiring.” Gloria Mercer became a Society member after moving back to Alvin in the 1980’s. She has served on several nominating committees as well as being a Marguerite Rogers House Mu-seum docent. After the Historical Museum opened in 2007, Gloria served as coordinator for volunteers in charge of opening and clos-ing and greeters for five years. Recently one of her “short term” projects” was to organize the Museum’s collection of yearbooks. To-gether with Jean her current task is organizing old records, a task Gloria says, “keeps her mind actively challenged”. Volunteer “OPPORTUNITIES” for YOU! Some exciting things are being planned for the coming months and, if you’d like to be a participant, we’d love to have you. As always, we are certainly in need of ‘volunteers’… If your specialty is gardens, meeting people (greeters/ docents), selling (gift shop), computer skills - - whatever it is - - we have a place for you. Remember…We NEED you! If you can help in any of the following areas, contact us via phone or Email at alvinms@att.net. We currently need volunteers in the following categories. ARCHIVES DATA ENTRY: HISTORY ‘DETECTIVES’ WANTED: MUSEUM VOLUNTEERS: Jerry Pryor challenges you to be a history detective 1)Greeters and help her identify people in old photographs at 2)Gift Shop the February 22nd meeting. 3)Group-Tours Coordinator I WILL !!! 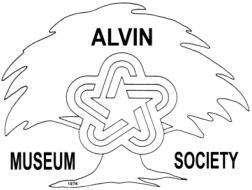 4)Openers/Closers Important Message from the Alvin Museum Society BOARD OF DIRECTORS Society Members, In January of 2016 the Board of Directors, by resolution, will change the fiscal year for the Society’s business to be from January 1st through December 31st. The current time period is from June 1st through May 31st of the following year. This change is seen as necessary to align our financial reporting with the calendar year, thus making the job of reporting income, anticipating revenues, and budgeting expenditures simpler. This change will impact the payment of dues for the coming renewal date of June 1, 2015. When renewing in June, 2015 members will pay only half of the amount due for a category, carrying their membership through December 31, 2015, (1/2 year). Then in January, 2016, with the change, memberships for the full amount of the cate-gory will be due paying the annual dues from January 2016-December, 2016. The Board asks for your support during this transition period. A letter will be sent to all members prior to the upcoming renewal date in June explaining the change. Any questions or concerns you may have can be sent to the Society email, alvinms@att.net., or by calling 281-331-4469 and someone will contact you. Thank you from your Board of Directors. MEMBERS WHO HAVE JOINED SINCE THE LAST NEWSLETTER Benefactor: Hoffman, Rebecca Ann Burns McCauley, Robert Parrish, Don (change from Patron) Pickens, Nita Richardson, Ginger Tanner, Judy Benefactor Couple: Beard, Robert and Elsie (change from Robert only on benefactor list) Crump, Troy and Mary Lee Goodson, Charles and Nancy Ryan, Ruth and Nolan Schwebel, Bob and Tissie Stansel, Jim and Sue Friend: Ballard, Madonna Pryor, Julie Vaughn, Bob Vaughn, Judy Patron: Agrella, Cathy Patron Couple: Jasper, John and Eileen Longest, Prentice and Rae (change from F-2) Business: Bunky and Son Construction Fairway Square Apartments Gordon Street Tavern Organization: Delta Kappa Gamma THANKS! We wish to say thank you to: Delta Kappa Gamma for the invitation to participate in the 2014 Christmas Tour of Homes. Over 160 visitors came through the Museum on the day of the tour. Claron Salter-Clark StateFarm Insur-ance for sponsoring the purchase of decorations for the old-fashioned Christmas tree . All Society Members who loaned or donated decorations. Museum Society members and friends enjoy decorating the tree on display in the foyer. PERSONAL MEMORIALS: (donations in Memory of) Julie Ann Palmer By Jerry H. Pryor Cleo Congrady By Jerry and Peggy Krampota By Delta Kappa Gamma Bernice Croix By AHS Class of 1953 Betty Nelson By Bobbie Nell Case By Hallie and Flora Ann Triplett By Annette Williams By Bob and Ruby Adams By Trent and Pat Klopp Hazel Gebert By Trent and Pat Klopp Sammie Henry By Delta Kappa Gamma Dolly Nicol By Elizabeth Weaver Bill Henry By Trent and Pat Klopp Mary K. Pane By Barbara Lennamon Audene Tacquard Moore By Jerry Pryor By Tommy and Renee Tacquard By Elizabeth Weaver Jewell Richardson By Ronald N. Nelson Carol Jean Libby By Howard and Louise Johnson IN MEMORY OF MEMBERS: Judy Crider Bob Jourdan Elizabeth Nelson CONDOLENCES TO : Bob Nelson on the loss of his wife, Elizabeth LaVerne ‘Missy’ Tatum on the loss of her sister, Mary Ellen ‘Cricket’ Plaster Cooper DONATIONS TO THE MUSEUM: Lynn and Don Shigekawa Bill Nelson Woodmen of the World, Lodge #0275 Claron Salter-Clark StateFarm Insurance Delta Kappa Gamma in Honor of: Keep Alvin Beautiful Julie Siggers, Alvin Convention and Visitors Bureau Staff & Docents– Alvin Historical Museum LOOKING AHEAD…. …..Sirens on Gordon Street; sheltering under school desks; unannounced drills…..If you have memories of any of these you may want to be a part of something AMS is looking toward in the not-too-distant future…. a ‘sounding group’ for recollections of the POW Camp for Ger-man soldiers which was located in Alvin in the mid-‘40’s. IT’S TIME TO CAPTURE THOSE MEMORIES FOR POSTERITY! Although this project will benefit AMS greatly, it is not ONLY for our enjoyment. An appeal will be made to the community for participation/information from anyone who might be of the era having recollections of the Camp and be willing to share them with others. Several have al-ready indicated an interest in this project, but it’s certainly not too late if you’d also like to participate. Please let Richard Klapper or Judy Scott know of your interest and contact information. ...More details will be coming soon!... Exhibit NEWS... Many THANKS to these local woodcarvers who provided us with a wonderful temporary exhibit. It was truly beautiful workmanship! Milton Alexander Dale Lewis Charlie Rutan Ken Havens Don L. Meade O’Neal White A new Temporary Exhibit is currently being developed on the artwork of local artist, Robert Earl McKinney. Donations: Check out our beautiful, newly-vamped website, www.alvinmuseum.org. It’s very user-friendly and Donation forms, as well as Membership forms can be found there! ...lots of other ‘stuff’ too! MOO… NEWS! Dairy Exhibit Almost Complete After many months of work, the Dairy Exhibit is almost complete. All the artifacts are in place and temporary labeling has been placed on the exhibit for review. The large graphic to go on the wall behind the exhibit is in final review before going to publication. Once it is published it will be mounted and the fence will go up completing the exhibit. MEMBERSHIP FEE TRANSITION FORM……. JOIN US! Alvin Museum Society - Membership Application – (June 1 through December 31, 2015) (FEE TRANSITION PERIOD) _____New ____Renew Date: _______________________ _______________________________________________ _____________________________________________ Individual / Organization / Business Contact Person Address: ________________________________________ Telephone: ____________________________________ City, State, Zip: __________________________________ Email: ________________________________________ Mail with your check to: Alvin Museum Society, P. O. Box 1902, Alvin, TX 77512 Individual Group ( ) Friend of the Museum……$10 ( ) Organization………….$20 ( ) Patron………………………..$25 ( ) Business……………….$50 ( ) Patron Couples………….… $40 (Please enclose business card.) ( ) Benefactor………………..…$50 ( ) Benefactor Couples……….$80 During transition, your membership renewal fee will be 1/2 of that amount listed.